March 2013 being the 28th birthday of the first ever registered Internet domain as well as the exigent launch of the Trademark Clearing House disguised as a milestone in rights protection by the Internet Corporation for Assigned Names and Numbers (ICANN) for it’s new gTLD program, Sharath Chandra Ram, dissects the transitory role of ICANN from being a technical outfit to the Boardroom Big Brother of Internet Governance. Click to read more about the Trademark Clearing House. As a non-profit organization, established in agreement with the US Department of Commerce in 1998, the current arrangement of ICANN has come under serious questions in recent years, with the United Nations wanting the ITU to oversee Internet Governance while Europe seeking more public participation in the decision making process that currently comprises a majority of private stakeholders as ICANN board members with vested interests. In this post we shall look at a few instances that give room for thought about the regulatory powers and methods adopted by ICANN as well as reparatory measures taken to reaffirm it’s image as an able governing body amidst disputes over trademarks and fair competition that might actually call for a wider and objective inclusion in future. An outline of functional and structural arrangements of ICANN maybe found at the CIS Knowledge Repository page. Earlier this month, (March 15, 2013) was the 28th birthday of symbolics.com, the first ever domain name registered in 1985 through the formal ICANN process. (nordu.net being the first domain name created by the registry on January 1, 1985 for the first root server, nic.nordu.net) Symbolics, that spun-off the MIT AI Lab and specialized in building workstations running LISP finally sold the domain for an undisclosed amount to XY.com, an Internet investment firm that has been proudly boasting about their acquired relic for over three years now. The golden days of fancy one word domain name resale at exorbitant prices are over, as Google’s page ranking crawler now really looks at unique content and backlinks. Nevertheless, those with the same archaic view of a real estate agent still believe that a good domain name does have a high ROI and have managed to find naïve takers who will offer ridiculous amounts. One of many such examples is the plain looking www.business.com that was bought initially for $1,50,000 and changed hands twice from $7.5 million to an absurd $345 million of R.H. Donnelley Inc., that soon filed for bankruptcy! The top level domain market however, is consistently lucrative. A TLD registry on an average receives $5 - $7 per domain registered under it. So the .COM registry run by VeriSign which, as of 2013 has over a 100 million registered domains, receives a revenue of $500 to $700 million per year of which a fraction is paid to ICANN periodically on a per-registration or per-renewal basis. Competing registrars and registries across TLDs, their revenue generation practices as well as the application process for new TLDs gradually began to be regulated by ICANN in mysterious ways, as we will see in the following legal case studies. VeriSign began to operate the .COM and .NET TLD after taking over Network Solutions Inc. and entering into a contractual agreement with ICANN in 2001. Let’s take a look at some methods used by VeriSign to garner internet traffic and registrant revenue, that were clamped down by the ICANN, which resulted in a lawsuit by plaintiff VeriSign claiming prevention of fair competition and revenue by impeding innovation. Clamping of Site Finder & WLS: In September 2003, VeriSign introduced a Wild Card DNS Service called Site Finder for all .com and .net domains. This meant that any user trying to access a non-existent domain name no longer received the 404 Error but were instead redirected to the VeriSign website with adverts and links to affiliate registrars. 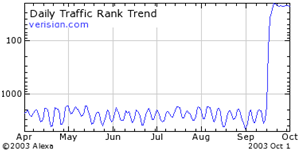 Often a result of a misspelled domain, in ICANN’s view, the redirection by VeriSign amounted to typo squatting internet users as within a month VeriSign’s traffic rose dramatically moving it to the top 20 most visited websites on the web. As seen below in this archived image of Alexa’s 2003 traffic statistic (Courtesy: cyber.law.harvard.edu). Shortly, in October 2003, ICANN issued a suspension ultimatum pointing Site Finder in violation of the 2001 .Com agreement. This was not the first time ICANN clamped down on VeriSign’s ‘profiteering’ methods. In 2001, ICANN prevented VeriSign’s WLS (Wait Listing Service) that allowed a registrant (through selected participating affiliate registrars of VeriSign) to apply to register an already registered domain in the event that the registration is deleted – a nifty scheme considering the fact that about 25000 domains are deleted everyday! The long drawn case of VeriSign Vs. ICANN ended on a reconciliatory note, with ICANN bringing the Site Finder service to a halt at the cost of VeriSign walking away happier with a free 5 year extension on the .COM domain (2007 extended to 2012). While the ingenious Site Finder service did pose a huge problem to spam filters, both the WLS and yet another service that VeriSign launched to allow registration of non-English language SLDs were also met with a cringe by ICANN. However looking closer, one may realize that the act of ICANN permitting a DNS root redirect service such as Site Finder for all TLD operators (with an acceptable template that also carried information about the 404 error besides other marketing options) meant the first step towards paving the way towards a plausible scenario of multiple competing DNS roots across TLDs being able to interact with each other — a system often argued by network theorists to be the most efficient and competitive model that would reduce the disjoint between the demand and supply of TLDs in a decentralized infrastructure, and that definitely was not in the best interest of ICANN’s monopolistic plan. Hence, this could be seen as a move by ICANN to nip the Site Finder bud while still young. Finally, as brought to public notice in more than one instance (name.Space Vs. ICANN, IOD Vs. ICANN), the vested interests of ICANN board members has come under glaring light. Can the ICANN leadership consisting of members from the very same domain name business industry be able to objectively deal with competing registry services and legal issues? Conspicuous targets have been chairperson Steve Crocker who owns a consulting firm Shinkuro, whose subtle investor is infact AFILIAS INC which runs the .INFO and .MOBI TLDs, provides backend services to numerous TLDs (.ORG, .ASIA, .AERO (aviation)), has applied for a further 31 new TLDs and has it’s CTO Ram Mohan on the Board of Directors of ICANN. Also ICANN Vice Chariman, Bruce Tonkin is Senior Executive at Australia’s largest domain name provider Melbourne IT, and Peter Thrush former chairman of the ICANN Board of Directors is Executive Chairman of Top Level Domain Holdings,Inc which filed 92 gTLD applications in 2012. Image Online Design (IOD) is a company that since 1996 has been providing Internet registry services using the trademark .WEB (trademark #3,177,334 including computer accessories) registered with the US Patents and Trademarks Office (USPTO). It’s registry services however, were not through the primary DNS root server maintained by ICANN, but through an alternate DNS root that required prospective users to manually make changes in their browser settings in order to resolve .WEB domains registered through IOD. Despite not running the primary DNS root server for. WEB, by the year 2000 IOD had acquired about 20,000 registered .WEB customers. The beacon of ‘hope’ arrived upon IOD in mid-2000 as ICANN (on advise of supporting organization GNSO) opened a call for proposals for registrations of new TLDs, with a non-refundable deposit of $50,000 for an application to be considered. By then the importance of the .WEB TLD for e-commerce was well known amongst ICANN board members with Louis Touton lobbying for his preferred applicant AFILIAS INC to be given the .WEB TLD, with others raising concerns about IOD’s preregistration of .WEB domains. One of the founding fathers of the internet, Vinton Cerf, the then Chairman of ICANN took a benevolent stance-- "I'm still interested in IOD," he repeated over Touton's objections. "They've worked with .WEB for some time. To assign that to someone else given that they're actually functioning makes me uneasy," he said, prompting board member Linda Wilson to chime in, "I agree with Vint." (http://goo.gl/d1v6X , http://goo.gl/eV9Jd). Finally amidst all the contention, no one was offered the .WEB domain and ICANN announced that all applications not selected will remain pending and those who submitted will have the option of being re-considered when additional TLD selections are made in future. And the future being, 2012, when ICANN invited a new round of TLD applicants, this time with the non-refundable deposit of whopping $185,000 for a single application (1 TLD/application as opposed to the $50,000 in the year 2000 that allowed multiple TLD requests within the same application) to be considered. While 7 new applicants for the .WEB TLD registered their interest, IOD considered their application to be still pending and did not join the new pool that included AFILIAS INC. and GOOGLE. The litigation of IOD Vs ICANN ended in Feb 2013, with IOD claiming weak causes of action under “Trademark Infringement” and “Breach of Contract” &“Fair Dealing” hinging on the fact that the initial $50,000 application was still pending and never was officially rejected by ICANN. Further, there was not enough room to make a valid trademark infringement, as there was no substantial room for consumer confusion in the .WEB case. The IOD Vs. ICANN case not only increased concerns globally, over the uncertainty associated with the ICANN application process for generic TLDs along with questions regarding the objectivity of its board members, but at the same time has alerted ICANN to take the necessary big sister steps to ensure that it’s well in the game. The fact of the matter is that the USPTO does not provide trademark protection services for the Top level Domain industry citing the reason that TLDs trademarks do not provide a distinct service mark that can identify or differentiate the service of an applicant from others, and further cannot be used to ascertain the source of an applicant’s services. This view is flawed, as by looking at a TLD, say BBC.com, an informed person can easily say that VeriSign INC manages the service of directing a user to a correct location on the .COM registry. With introduction of new gTLDs, perhaps BBC would shift it’s content to BBC.news, where the source may be an abstracted Registrar and the nature of service being quite evident. And to those registered trademarks, especially those that shall result in substantial brand confusion to the customer if infringed, granting a TLD like .ibm or .bbc may well be granted to the owner of the trademark who may then outsource registry services to a service provider. This shall invert the current model by relegating the role of a TLD registry holder to that of a contracted service provider. So the question is, should have the US Department of Commerce, who contracted ICANN in the first place, mediated with USPTO to place the business of a registrar on par with other trades and businesses, and modify it’s trademark infringement policies? And more importantly, will ICANN view this as introducing yet another key stakeholder to the gTLD assignment process? The answer to the latter is already clear as ICANN being in the top of it’s game decided to take matters into its own hands and on March 26, 2013) launched http://trademark-clearinghouse.com/ with a new set of guidelines for accepted trademarks and a mechanism that allows trademark holders to submit their application to a central repository. Accepted trademark holders shall be given priority to register gTLDs during the ‘sunrise’ period. Deloitte Enterprise Risk Services have been assigned the responsibility of evaluating submitted trademarks while IBM shall maintain the actual database of trademarks by the later half of 2013. The tip of the iceberg is well in scope of view. ICANN46 is currently being hosted in Beijing, at the China Internet Network Information Centre (CINIC) from April 7 to 11, 2013 while hopefully parallel discussions will happen on all other global forums to hopefully re-consider a future of multiple competing DNS root servers towards healthy competition that is decentralized. Lynn, S.  “Discussion Draft: A Unique, Authoritative Root for the DNS” Internet Corporation for Assigned Names and Numbers, 28 May, 2001. Internet Architecture Board  “IAB Technical Comment on the Unique DNS Root.” RFC 2826, Internet Society, May 2000.